Anything with “pink” in the name is bound to have grenadine in it. 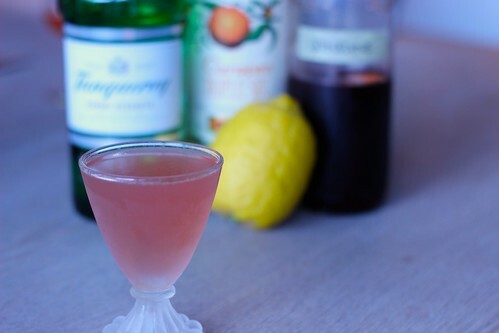 All of the books have gin and grenadine for this, but Lommebogen gives a wallop of sweet with a healthy dose of curaçao, and then tries to balance that with a little lemon juice. The Savoy/Café Royal version sticks to grenadine for the sweetener and adds an egg white. The Lommebogen version is very gin and very sweet. Not exactly what I was hoping for, as the heavy curaçao is pretty prominent, and not in a way that I like. It’s just an unbalanced drink, which is a shame since I think it has the better color of the two. The Savoy/Café Royal version is definitely the better of these two. It isn’t as sweet, and the egg white gives it more body. It’s still a bit sweet for me, and frankly the color is a little more dishwater than pink, but I think it would do OK with some of my friends that like sweeter drinks. Overall, I think the Pink Lady is not a drink I’d keep around though.